Christmas is almost here! Trees are decorated, parties are happening and Christmas music is everywhere! 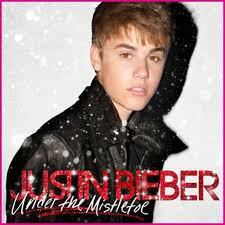 Justin Bieber’s song "Mistletoe" is back on the air and in the stores! It debuted in 2011 and is still on many people’s Xmas music play list. So don’t be surprised if you keep hearing this song wherever you go! Check out the video and try to fill in the missing blanks below. Enjoy! Ok, now go through the video one more time and answer the Comprehension Questions below. However to help you out, I have given you the meanings to some of the key slang terms from the song. imma be = I am going to be. a "shawty" = a pretty girl. 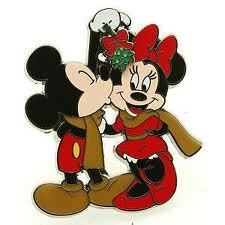 A plant; see picture of Mickey and Minnie under the mistletoe below. (2)What usually happens under the mistletoe? Christmas custom, any two people who meet under a hanging of mistletoe are obliged to kiss. (3)Does Justin Bieber want a Christmas gift from his girlfriend? (4)What does Justin Bieber want to do for Christmas? He wants to be together with his girlfriend under the mistletoe. (5)What are some of the Christmas activities that Justin Bieber feels he ‘should be’ doing? He should be: playing in the winter snow, chilling with his folks, making a list. He is definitely a very good artist. We all enjoy his shows. I agree! I just read your blog. It's got lots of great, up-to-date Celebrity info! I will be keep checking in!